Oxygen is proud to present, through partnership, a unique security ecosystem that takes all facets of security into account when creating a strategy to mitigate modern day cyber threats. 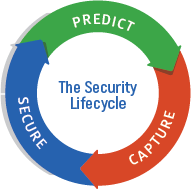 Through our “predict, capture, and secure” managed security solution we look to educate the end users on how to work with technology, secure the network at the edge, and monitor what is happening inside the network. The #1 point of risk inside of any network is the user. Over time, with the utilization of ongoing training, this security solution employs ongoing training to improve the user’s awareness and knowledge as to potential risks, so users are prepared to take appropriate action when faced with a potential security breach. SonicWALL CAPTURE works seamlessly with your SonicWALL firewall where any file without a recognized origin is placed in a secure “sandbox”. The file is then tested without affecting the live network. This approach reduces the risk of zero-day attacks by enhancing security outside your network, before infection is possible. SonicWALL CAPTURE is the only multi-engine “sandboxing” solution on the market today. SonicWall uses three “sandboxing” services: VMRay, LastLine, and SonicWALL’s own proprietary service. Partnering with Security Resource Group, a market-leader based in Regina, SK, our Managed Security solution provides ongoing Penetration Testing on the internal network. This proactive probing helps to mitigate the risk of potential issues with applications or services on Servers and Workstations. This robust, enhanced security solution reduces the potential of software being exploited as an entry point into your production network. Continual testing of the software on your network. Provides recommendations on how to fix the issues. PARTNER WITH AN EXPERIENCED TEAM. ACCESS YOUR FULL-SECURITY SUITE TODAY! Contact us today, to find out how to reduce your exposure to modern cyber threats.